The Video Scene Analyser System (VSAS) is a software application for real-time video stream analysis. 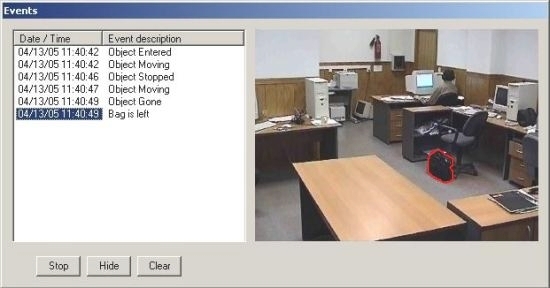 VSAS provides a solution for object motion detection, object tracking, scene analysis and events detection. 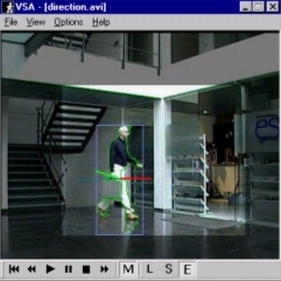 The VSAS is based on a unique technology analysing human activities, movements, interactions and behaviours. VSAS analyse in the real time a video streaming directly from a camera or media storage (analogue or digital). The VSAS supports the common media format (avi) and video stream from camera or VCR (VideoForWindows). 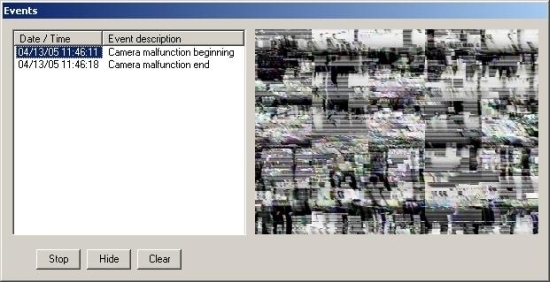 The VSAS player controls the analysed video sequence. The basic VSAS function is detection of human presents. 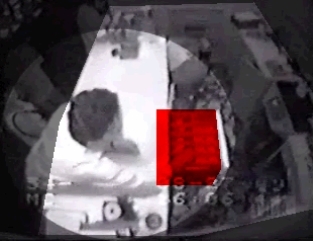 The video frame is grabbed and saved with a time stamp in a database “Event window”. The “Event window” graphically describes the detected activity. It can be used for search and automatic data retrieval of similar events from a large database. The video control window includes a toolbar emulating the front VCR panel with function buttons controlling play, stop, and pause, operated with a simple mouse click. When using media files, the video control window has a position slider allowing quick access. The VSAS detects and tracks moving objects, motion directions and motion speed. The natural noise is automatically filtered out, which makes the VSAS system not sensitive to the lighting changes. The moving object is indicated with a green contour and blue rectangle. A red vector shows the motion direction and velocity, a green vector – the reference direction. Yellow contours indicate human face region. The events history is stored in "Event windows” with time stamp and event type. It is possible to trace object behaviour inside the visible zone frame by frame. A human model is visualized in a separate window ("Model Window"). The model reflects the motion direction and the relative object position inside the scene. The user can manually define a specific area as a ROI (Region Of Interest). In the shown example the analysis area is restricted by a user and defined as a free form polygon. The shaded part indicates the area not being analysed. The user may additionally select special areas (control zones) for events detection (red zone). They are marked with red colour. Any motion inside such control zone will be recognised and registered. VSAS includes a module storing all registered events in a database. All events are stored in records annotated with: date, time, event type (name) and corresponding image. It can be used for easy retrieving and reviewing of detected object behaviour. The video stream can be analysed on-line or off-line. The predefined events will be automatically extracted. 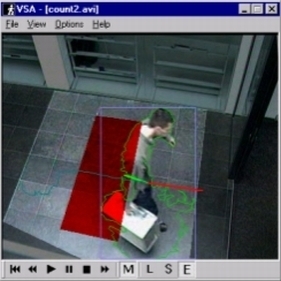 The VSAS application can be used for various automatic recognition and detection systems. The modular architecture and unique recognition/detection approach allows to build complex applications in a very short time. Application areas: Video surveillance, control and security systems.